Chick was a particularly divisive figure among his fellow cartoonists, whose arguments about the fanatical artist were concerned as much with aesthetics as morality. Many cartoonists, especially in the tradition of underground and alternative cartooning that emerged in the 1960s (most famously the scandalous Robert Crumb) have an intense admiration for Chick, extolling his undeniable passion and heartfelt quirkiness. Demons played a big part in Chick’s work, and he was gifted at endowing them with a visceral reality. Chick believed in the demons he drew; they were as real to him as the people he met when he walked down the street. He was sufficiently talented as an artist that he could almost make you believe in his visions of sly, sneering impish demons trying to snare humans at every turn. A deft hand at grotesque caricature, Chick was more successful at drawing sin than sainthood. He was perhaps best at capturing the sneer of pride in those rejecting faith and the bug-eyed fear of non-believers who learn, too late, that they are doomed to Hellfire. 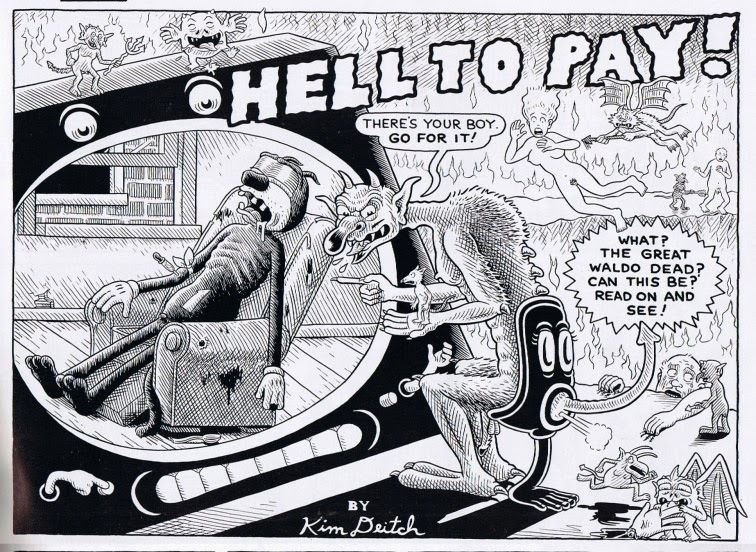 “He had authentic greatness,” Kim Deitch, one of the stalwarts of American alternative comics for nearly 50 years, told me in a Facebook exchange. “He knew how to use the comics medium. You didn’t have to agree with his point of view to appreciate the compelling way he could [carry] a story over.” Deitch’s admiration perhaps stems from his being a sort of secular counterpart to Chick. Since the late 1960s, when his work first appeared in The East Village Other, a small New York underground newspaper, Deitch has produced hundreds of pages of off-the-wall comics exploring an elaborate private mythology featuring characters like Waldo the Cat and Jesus Christ. Deitch’s work is revered by fellow cartoonists like Art Spiegelman, Robert Crumb and Chris Ware, but it hasn’t won the same level of fame with the general public as the esteem it has within the world of alternative comics. Deitch has become a model for other cartoonists thank to his persistence in producing visionary comics in a world where artistic merit and commercial success rarely overlap. Chick’s an individualist, a loner protesting even Protestant forms of organization. In his Battle Cry interview, Chick says that he had to leave his own church (a “Jesus Only” congregation, meaning that Jesus, not God, created the Universe) after he exposed its “sin and hypocrisy” in his first published comic: “I got the cold shoulder because I drew some people…in the choir, and they recognized themselves.” Chick’s no choir boy; he refers to well-known evangelists as “the biggies on Christian television,” and always refers to himself in minuscule terms: living in “my little home,” driving “my little Renault,” and running “little Chick Publications.” Of course this much humility on display points to a megalomania reveling in underdog status, a little David who fancies himself slinging stones at the Goliath religions. Not everyone is even willing to concede Chick had talent. Matt Bors, founder of the comics site The Nib, writes, “Let’s be honest, the storytelling conventions of Chick’s tracts were cluttered with expository dialogue and ham-fisted narration ramming a scared-straight fable down the reader’s throat ... I think people have convinced themselves that Chick is actually good somehow because he worked in this old style of comics they read as kids but applied this bizarre Christian lens to the modern world. Putting his beliefs aside, I simply don’t think it was very good work.” (Bors parodied Chicks work here). Bors goes too far. In truth, Jack Chick was the Leni Riefenstahl of American cartooning. Like the Nazi filmmaker who made Triumph of the Will, Chick was an artist of genuine skill who put his talent in the service of an odious ideology. Both Riefenstahl and Chick raise perennial and unsolvable problems about the relationship between content and form: Can art transcend the intentions of the artist? Can we separate out the message of a work of art from the artistry it contains? Art that helps us understand the mind of another is valuable, but what do we do with art by a mind like Chick’s, whose sheer hatefulness numbs empathy? Even evaluating Chick as an artist is to neglect his intentions. He was forthrightly a producer of agit-prop. By his own account, he started doing cartoon tracts because he was told that Maoist Communists had found this a useful mode of propaganda. To see Chick solely as an artist, then, is to reject his own approach to life and art: His art was a conduit for fire-and-brimstone message. Paradoxically, those who are most likely to value Chick as an artist—cartoonists working in a counterculture tradition—are among the people he most despised (to judge by his nasty, vindictive portrayal of hippies). If Chick were still alive, he’d be sure to remind these fans—with perhaps more sadness than malice—that they’re going to burn in hell.